No rotating camera? - Check out the latest leaks with the Oppo N3! You are here: GeekSays Technology News » General » No rotating camera? – Check out the latest leaks with the Oppo N3! No rotating camera? 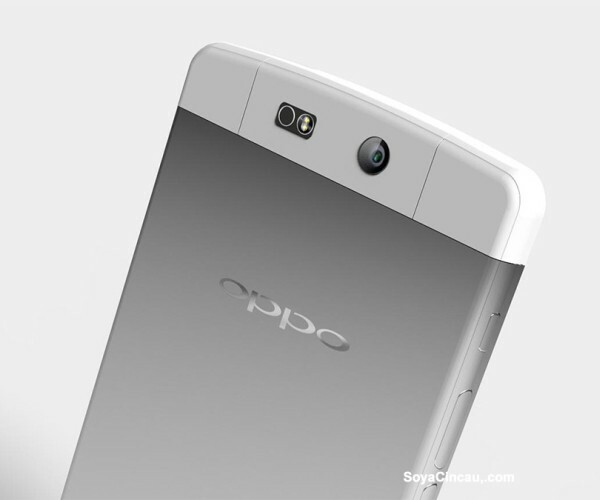 – Check out the latest leaks with the Oppo N3! A few days ago, GSMArena was providing a first set of leaked photos with was supposed to be another selfie phone, the Oppo N3. The design was a bit weird, reminding us, in someway or another, about some flip phones, thanks to the…well, cylinder on the top, housing the rotating camera and the speakers. Still, the same source comes today with a new render of the phone, coming from a tipster. As you can see, there’s no sign of a rotative camera, at least like the first renders were showing, as the Oppo N3 is featuring a whole new design. The cylinder at the top is gone and it was replaced by a camera module similar to the one seen on the manufacturer’s previous model, the N1. On the other side, the Oppo N1 had a camera that could rotate, as the whole module was mobile, enabling you to flip it at 180 degrees, so we don’t exclude this possibility. Also, the picture leaves an impression that the Oppo N3 could be made out of metal, but this is just a guess. This is it for the moment, but the company has an event scheduled for October 29, in Singapore, where the N3 will be revealed, so we expect even more leaks to come up soon.